This level has medium difficulty. 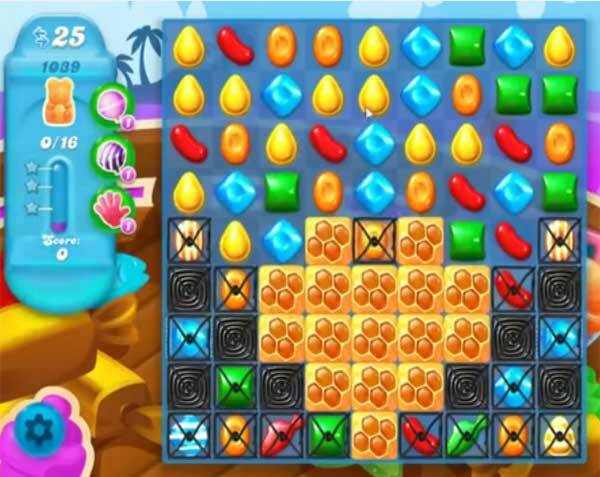 For this level try to play near to blockers to break them and make special candy as you get the chance. Combine them with each other to break more honey blockers or play near to remaining honey blockers to save the bears. They took away the Exploding candy in the middle which makes it that much harder. They have removed the wrapped candy from the middle AND introduced extra colours making this level impossible without a whole host of boosters…..it’s a money making ploy! time to quit! Can’t be done without boosters now. Unfair! Wat een stom spel hier kom je niet uit zonder boosters,is totaal anders dan de video ! Not fun anymore time to delete program they’re making it impossible to pass without buying boosters. Can’t and won’t buy boosters so time to go. I agree with all the above comments. They now give you 44 moves with 6 different colors. It’s extremely difficult to make special candies let alone combine them when you are able to make them. Can’t even get close! Just another level designed to make you spend money . Not fun at all.